With the Accent, you really can have it all! Even better, you can choose between the 4-door or 5-door design, whichever best fits your style. The Accent is everything you can ask for in a car. With class-leading room‡ , you know it’s ready for your busy life. The Accent also offers many features such as standard rearview camera and available heated front seats, not to mention the availability of smartphone connectivity with Android AutoTMand Apple CarPlayTM. The best part? Suit your style by choosing either the 4-door or 5-door. We offer elite quality through meticulous design and painstaking craftsmanship. Our three design centres in Korea, the U.S. and Europe compete against each other to bring you cutting-edge designs — designs that not only look stunning but are also aerodynamic and fuel efficient. 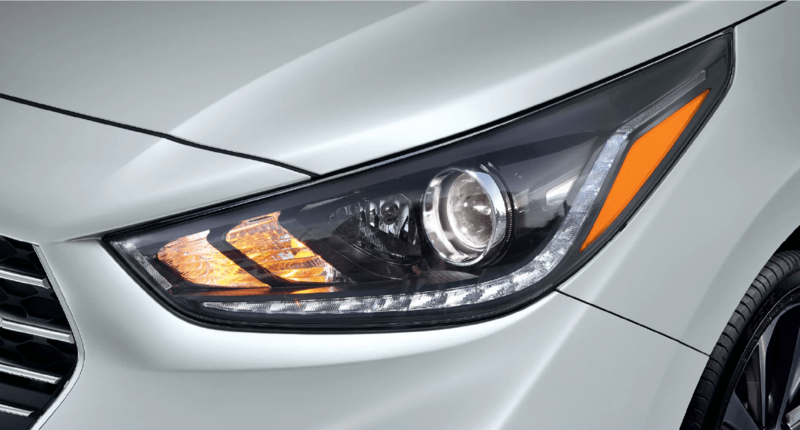 The Accent has more visibility and greater energy efficiency from its, all new for 2019, wraparound headlights with optional LED lighting system. 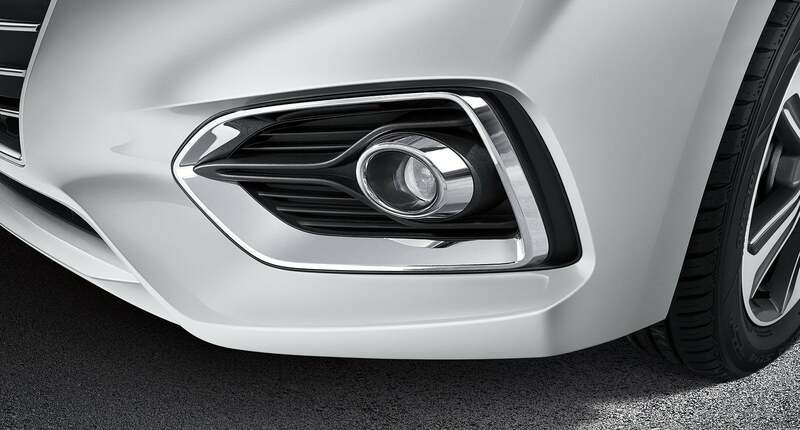 Drive with confidence in compromised weather situations with available stylized fog lights that provide significantly greater visibility. 17 (inch) wheels are a perfect complement for the prominent wheel arches on the 2019 Accent. 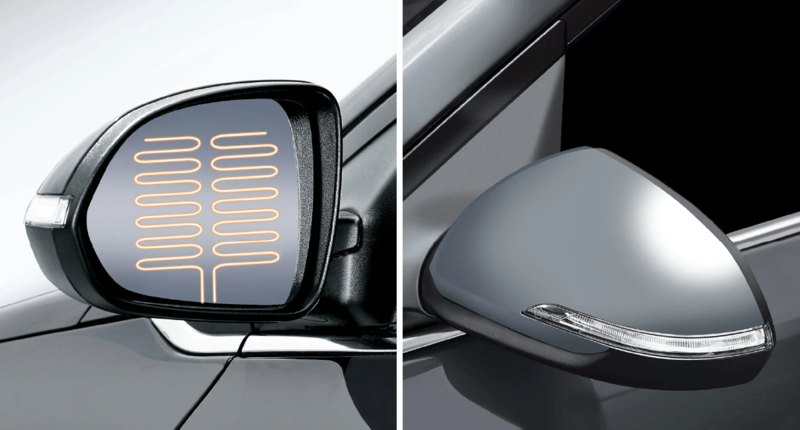 The available integrated LED side repeaters are a great match to the power-adjusted, heated side-mirrors. You can also stay connected, safely, with available Apple CarPlay™ and Android Auto™ to access your favourite smartphone apps via the available 7.0" touch-screen display. With the standard 5.0 colour touch-screen audio display, you can stream your favourite music from your smartphone and stay in touch with friends and family with the available bluetooth system. Exceptional cargo space. Not only does the Accent already have a roomy trunk space, but with the 60/40 split-fold rear seats, you can carry long items while still hosting a passenger in the rear seat. 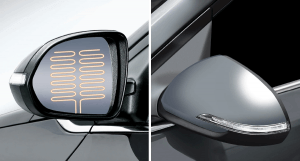 The available automatic climate control continuously monitors the temperature levels and controls the airflow to maintain your preferred settings. Too many pockets to find your keys? That won’t matter with the available proximity key. Your Accent will sense the proximity key so you can unlock it when you press the front door handle button. 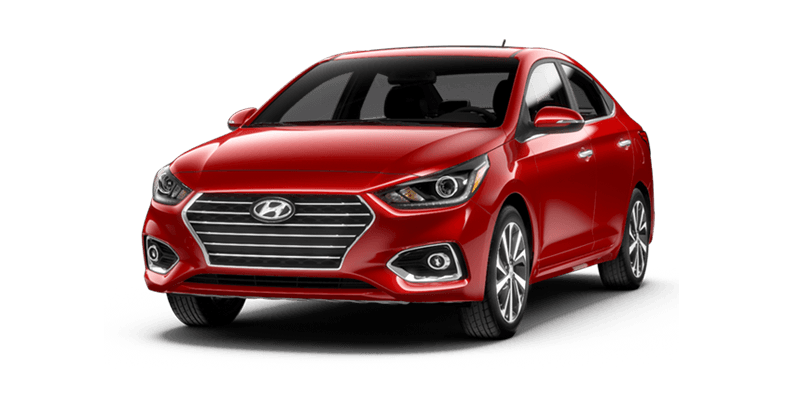 The Accent features an eco-efficient 1.6L Gasoline Direct Injection engine that generates 130 horsepower and 119 lb-ft of torque. Choose between the 6-speed manual and available 6-speed SHIFTRONIC. automatic transmission, and drive without having to compromise power or efficiency. The standard eco-efficient, 1.6L Gasoline Direct Injection, engine generates 130 horsepower and 119 lb-ft of torque. 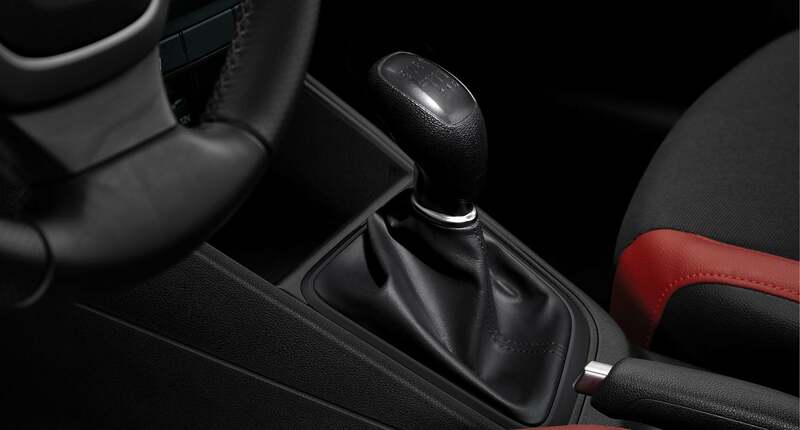 You can choose the standard 6 speed manual transmission on the Accent or opt for the 6 speed automatic transmission with Shiftronic manual mode. To achieve enhanced drivability and fuel efficiency, air vents have been integrated on both sides of the lower bumper to reduce resistance around the wheels. To deliver superior control and safety, the state-of-the-art platform with the Advanced High Strength Steel was built at the core of the Accent. By absorbing and redirecting harmful energy during a collision event, the SUPERSTRUCTURE™ helps protect the occupants inside the vehicle. The exceptional stiffness and strength of the SUPERSTRUCTURE™ also offers more precision in the suspension components to enhance the balance between handling control and ride. With the use of radar, this safety feature is designed to detect and notify the driver of any rapidly approaching vehicles directly ahead. When a potential forward collision is detected, the driver is alerted with visual and audible notifications. 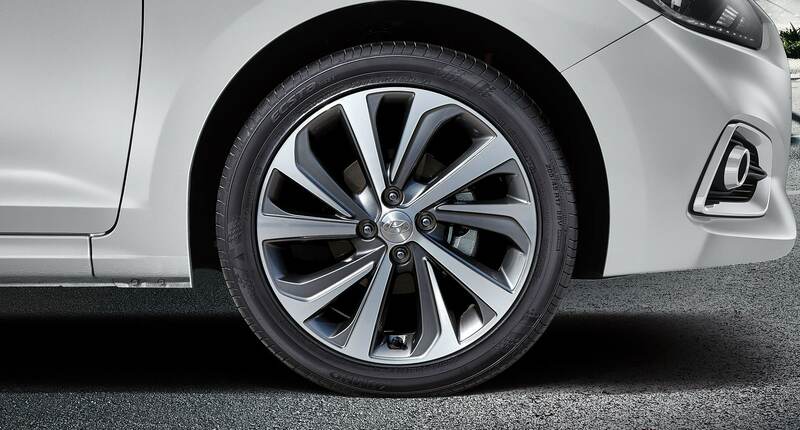 The system can then provide full braking assistance if the driver doesn’t react in time to avoid an impact. With six standard airbags, the Accent offers the best safety. There are two advanced front airbags, two seat-mounted side-impact airbags, and two side-curtain roof-mounted airbags with rollover sensors. The standard review camera is designed to offer you greater confidence when parallel parking or reversing out of narrow driveways. With available Android Auto™ and Apple Car Play™ smartphone connectivity you can use the touch screen or voice commands to use navigation, stream music, or interact with your favourite apps. Keep your focus on the road and hands on the wheel by using voice recognition through the available Bluetooth hands-free phone system to stay in touch with friends and family while you drive. 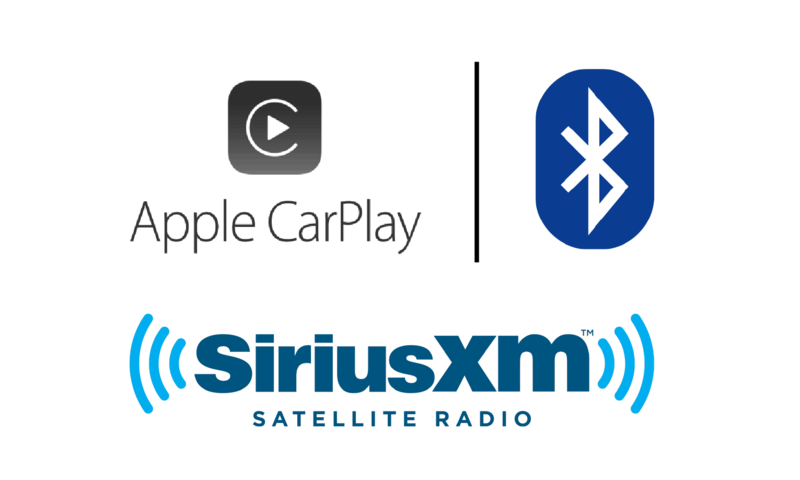 With a 90-day complimentary subscription to SirusXM Satellite radio, you can tune in to over 130 channels.